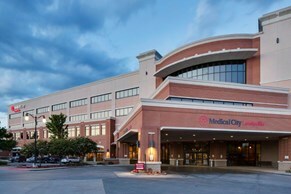 Medical Center of Lewisville is the premier medical center for health services, information and education. Our mission at Medical Center of Lewisville is to provide a health care organization that consistently delivers high quality health services, information and education. We promote a culture that is professional, compassionate, and responsive to our patients, our physicians and our associate. Medical Center of Lewisville's convenient, central location helps us serve many communities in southern Denton County. Our beautiful, state of the art patient tower was built in 2003. Progress along with caring is our focus. Recognitions and Honors include: JCAHO Accreditation in 2006, Voted Best Hospital (Again) in Denton County in 2006, Texas Hospital Association Member, American Hospital Association Member, Dallas-Ft. Worth Hospital Council Member, and in 2006 we received Chest Pain Accreditation by the Society of Chest Pain Centers.